This four piece cleaning kit is the best in the industry, complete with a Detail Brush, Drying Towel, Polish, and Sponge Applicators. This amazing detail brush is made to remove polish and excess oxidation from intricate patterns. The horsehair bristles get into all the hard to reach nooks and crannies, leaving your silver with an excellent, even shine. Give new life to your silver collection with this amazing ayliss polish. Our top seller, this silver polish is the best in the business. We use our polish to clean all of our inventory and our customers' personal silver goods. Each container holds 8oz of polish. *Do not rub off any streaking after using the Silver Butler and do not wash the towel (let it air dry). 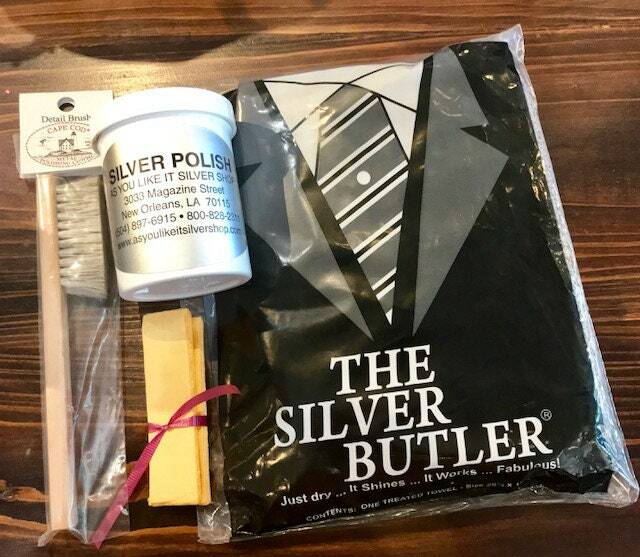 Use pre-treated Polishing Gloves when your silver is just beginning to tarnish again, and then rinse and dry off with the Silver Butler drying towel to preserve the shine. Write dates on the protection strips and change out every 6-8 months (these work only in enclosed spaces).